UThome Review 2019: Is UThome a Good Hosting? UThome is a Taiwanese tech company that provides Windows and Linux hosting as well as VPS and dedicated servers to more than 2,000 customers. Its success is anchored on three things: fast servers, affordable hosting, and great customer service. Taiwanese tech company UThome was founded in 1997. This web service provider specializes in web hosting, VPS, dedicated servers, and domain registration services plus programming and web design. In the course of its long history (in internet years) this company has built good customer satisfaction through continuous innovation. With options to sign up for cPanel or Plesk hosting plans, UThome provides customers with convenient environments to build and manage their HTML/PHP or Windows-specific apps. I have personally used both platforms before, and I can tell you that it only takes a few days to master the backend. Also, this company can create databases, register add-on domains, and much more. I did a little digging, and I discovered that UThome’s data center contains enterprise-grade servers connected to multiple networks and redundant power supply. No wonder this vendor has been able to offer fast and reliable hosting services. It’s also nice to know that they monitor their servers around the clock so they can respond to issues before they cause website availability problems. My only concern is that UThome’s servers aren’t available in Europe and North America. 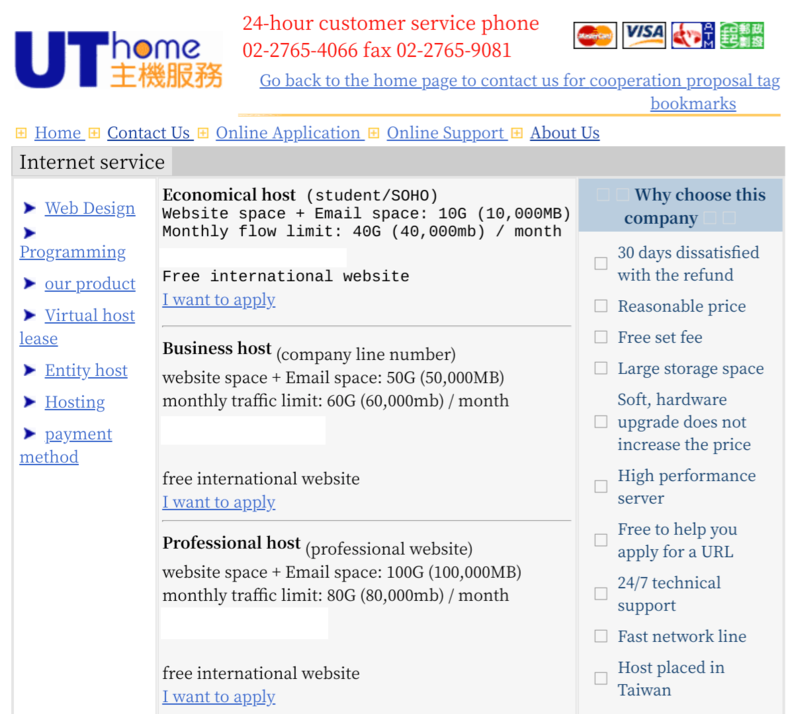 UThome is one of the lowest-priced hosting providers south of China. Its plans are fully backed by a 30-day money-back guarantee. Account setup and upgrades are instant and are activated as soon as you have paid using a convenient method such as MasterCard and VISA. Although support is available only in Chinese, I do like the hands-on approach of this company’s technical team. The multiple support channels include telephone, 24/7 email, and fax (remember those?). There is also a knowledge base (of sorts), but you’ll have to let your browser translate it into English or your native language if you can’t read Chinese. UThome is a worth considering if you’re looking to set up a website or an online store targeting customers in Taiwan and mainland China. Wondering how UThome stacks up against other Web Hosting companies? Enter any other Web Hosting company and we will give you a side-by-side comparison.